Clockwise from top-left: Gornath Chalanseth, Bijay Kumar Sanseth, Bhaskar Sunamajhi, Munda Badamajhi, Sanatan Badamajhi, Budhadeb Nayak and Durjo Sunamajhi. The chief minister of the south Indian state of Kerala has called for a fresh probe into the 2008 murder of a Hindu leader, which sparked months of rioting, in which almost 100 Christians were killed. Chief Minister Pinarayi Vijayan was speaking on Tuesday (13 Dec.) at the launch of the Malayalam translation of ‘Who killed Swami Laxmanananda?’, an investigative book by Catholic journalist Anto Akkara. 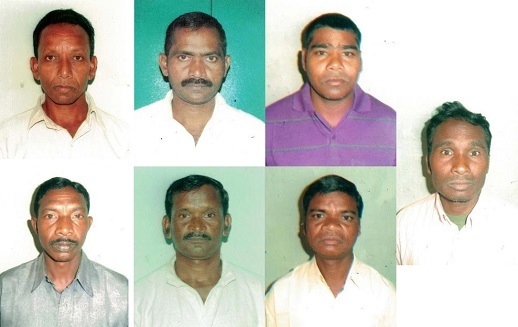 Seven Christian men, six of whom are illiterate, were convicted in 2013 of the swami’s murder in Kandhamal, in the north-eastern state of Odisha. 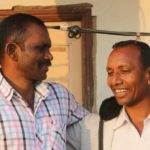 The men – three of whom are Dalits, the other four tribals – pleaded not guilty, and in his book Akkara sets out to prove their innocence. Mr. Vijayan, a senior member of the Communist Party of India who heads a left-wing coalition in Kerala, said: “The book forcefully shows that the allegation that Christians killed the swami is itself a concocted conspiracy. Yet seven innocent Christians have been convicted to life imprisonment for Swami Laxmanananda Saraswati’s murder. India’s communists have frequently clashed with Hindu nationalists, whom they accuse of not respecting India’s diversity. In such issues as the Kandhamal riots, Communists often support harassed minority groups. With his call for a “fresh probe” into the riots, the Kerala Chief Minister has taken a bold step in support of the Christian minority. 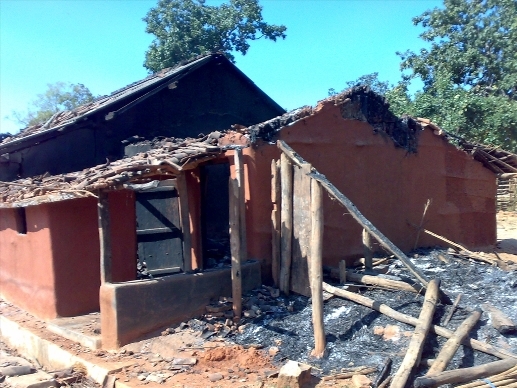 After the swami’s murder in August 2008, a rumour circulated that Christians were responsible, although Maoists claimed the killing soon after it took place. Hindu mobs began rioting, ransacking 300 churches and some 6,000 homes. More than 50,000 Christians were displaced. Three hundred churches were ransacked and some 6,000 Christian homes damaged after the murder. Mr. Vijayan said that Hindu mobs had been “incited to attack the Christians” and that the three months of violence that followed the murder had been orchestrated. 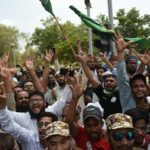 In August, India’s Supreme Court Chief Justice, T. S. Thakur, said it was “very disturbing” that many of the perpetrators of the riots had not been brought to justice . An investigation noted that of the 827 criminal cases registered, 315 cases were not pursued, while of the 362 cases in which a verdict was given, “only 78 [trials] resulted in [a] conviction”. Although 6,495 people were arrested, just 150 cases are still ongoing. The Supreme Court ordered Odisha State to investigate “wherever acquittals were not justified on facts”. He also said that compensation paid to the victims had been “inadequate“. 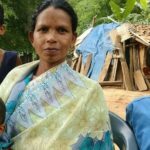 Last year, two senior police officials testified before the Kandhamal judicial inquiry commission that the allegations against the seven accused were false, according to a website seeking to free the men. The website also notes that their appeal hearing has since been repeatedly postponed. Ravivarma Kumar, the Advocate-General of Karnataka, another southern Indian state, has said the Christians were given life terms despite the fact there was “no eyewitness to the [swami’s] murder and hardly any evidence”.